My little "treasure chest" included carbon copies (who out there besides me remembers typing those?) 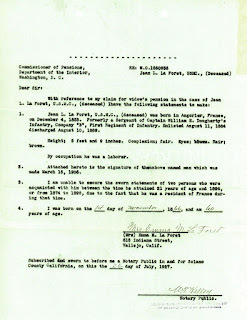 of three pages that appear to have been sent in response to the letter of May 17, 1927 that was addressed to Emma La Forêt. All of these are typed clearly and have almost no handwriting, so I think I'll forego the transcriptions today. 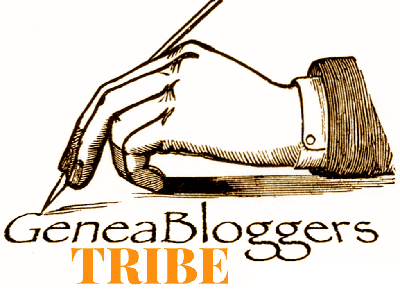 The May 17 letter also requested that the information be a sworn statement from Emma. This letter is signed by her and notarized by W. T. Kelley, a notary public in Solano County, and impressed with his notary seal (which doesn't show in the scan above). Emma included her birthdate and age, which was requested on the second page of the circular, although not as a numbered item. There's a small time conflict for the years Emma said Jean was a resident of France. If he was living there from 1874–1896, then how could he have served in the U.S. Marines from August 11, 1884 to August 10, 1889? I doubt that his five years of service were all in France. Maybe the pension office asked her to clarify that later. Unfortunately, the example of Jean La Forêt's signature isn't included. She didn't state in her letter what the signature was on. The fact that it's from March 15, 1906 means that it not only predates Jean and Emma's marriage, but also Emma's divorce from Emile Petit. Ah, well, when I get around to ordering a copy of the pension file, maybe it will be included there. This is an 8 1/2" x 11" piece of canary onionskin (another thing many people today won't recognize, I'm sure). It is all a typed carbon copy except for the same notary's signature and impressed seal, and a handwritten date. 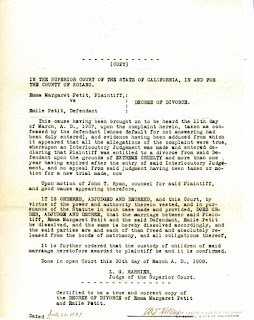 This is a transcription of the final divorce decree for Emma Schafer and Emile Petit. It was in answer to item #5 on the circular, which was a request for proof that the claimant was widowed or divorced from any former husbands. 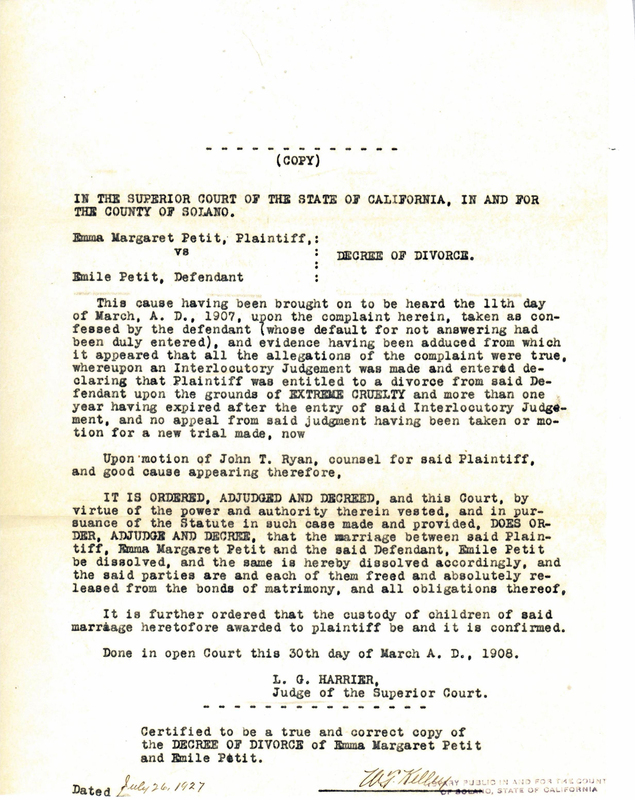 I have an original copy of that divorce decree, so I was able to compare the two documents word for word. I found three changes in wording: "haveing" was transcribed as "having", and two words were omitted—"the said Plaintiff" became "said Plaintiff", and "each of them is freed" became "each of them freed." Other than that, some words were typed in capital letters that weren't in the original, and it wasn't noted that "L. G. Harrier" was a signature. Overall, that's a pretty good job, though not perfect. This is a second piece of 8 1/2" x 11" canary onionskin and another typed carbon copy. The only items not typed are the notary's signature and his impressed seal. The date at the bottom (which is next to the seal, which still doesn't show in the scan) was typed directly on this piece of paper, as opposed to having been from the carbon paper. The word "were", interpolated between the fourth and fifth lines of text, was also typed directly on this sheet. 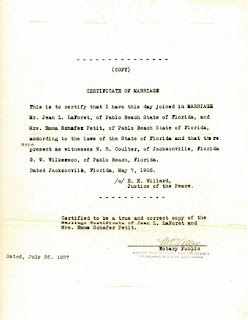 This page fulfills #2 from the circular's list of requested items and is a transcription of Jean L. La Forêt's and Emma Schafer Petit marriage certificate from Florida. That I don't have a copy of, so I have to rely on the transcription to be accurate. 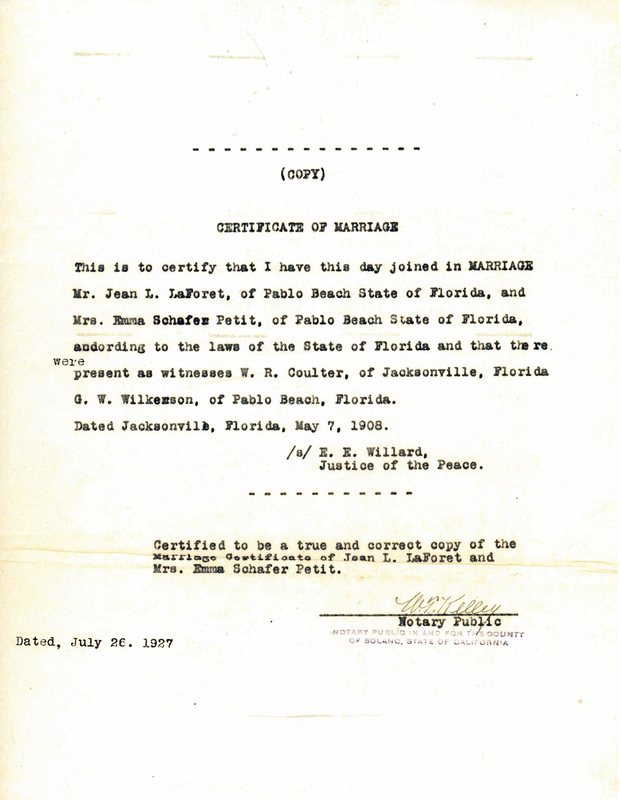 It says they were married in Jacksonville, so I guess I'll be writing to Duval County when I try to get a copy of the original. Emma was pretty good at following directions. Referring back to the letter from last week, it looks as though she sent everything requested except #4, a statement about whether any former husband had served in the U.S. Army or Navy (this office really didn't deal with Marines on a regular basis, did it?). I'm sure they came back to her with another letter asking where that was. Her sworn statement was made before a notary, so she followed that instruction. The copies of the records were attested to by the notary. It appears that Emma didn't quite comply with some other directions, though. 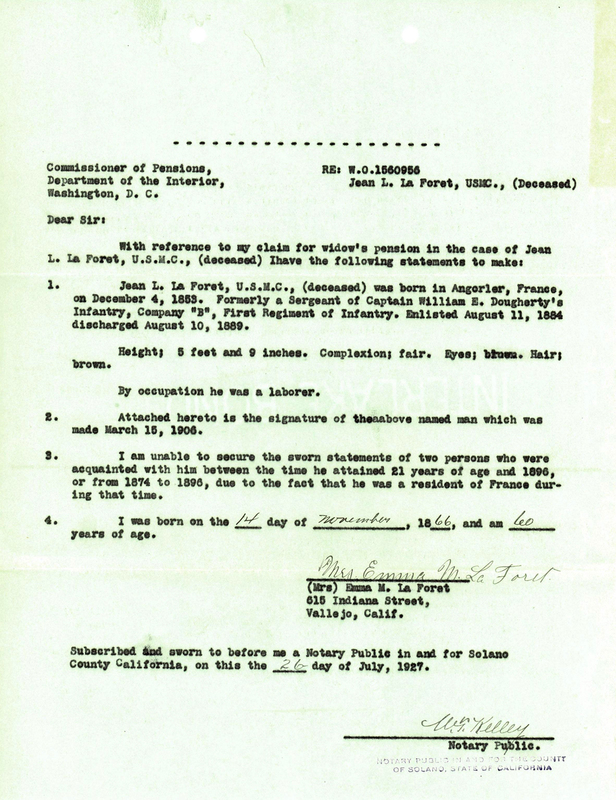 The circular said that every document needed the name and service number of the Marine, but the two transcriptions don't have that information. Maybe they were added to the original copies before they were mailed to Washington.